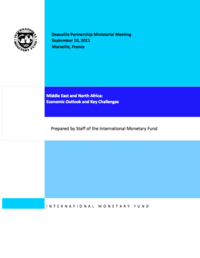 The International Monetary Fund (IMF) analyzed the regional economic outlook and key challenges in Egypt, Jordan, Morocco and Tunisia. Economic risks in the Middle East and North Africa (MENA) region have risen as the uncertainties inherent in the political transition in a number of countries persist and social unrest continues. Oil importers are facing a significant economic downturn, with limited fiscal room and rising borrowing costs. The immediate challenge for oil importers is to fulfill peoples’ expectations while preserving macroeconomic stability. In 2012, their external and fiscal financing needs are projected at about $50–55 billion and, with capital markets providing only a small part of these funds and at a higher cost, official financial support will be essential. Now is also the time to begin formulating a broad reform agenda and embedding it in a medium-term macroeconomic policy framework to build confidence, anchor expectations, and provide the basis for sustained inclusive growth.